Ludovisi Ares, Roman copy of Greek original c. 380 BCE. 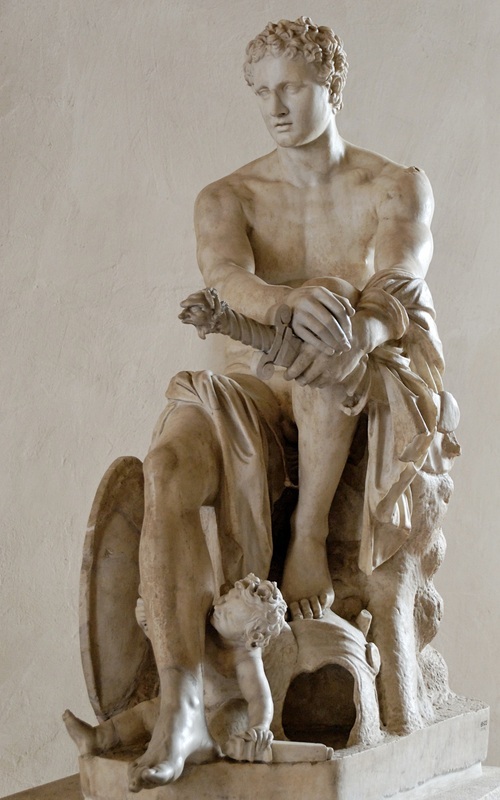 Ares, upon one occasion, incurred the anger of Poseidon by slaying his son Halirrhothios, who had insulted Alcippe, the daughter of the war-god. For this deed, Poseidon summoned Ares to appear before the tribunal of the Olympic gods, which was held upon a hill in Athens. Ares was acquitted, and this event is supposed to have given rise to the name Areopagus (or Hill of Ares), which afterwards became so famous as a court of justice. In the Gigantomachia, Ares was defeated by the Aloidæ, the two giant-sons of Poseidon, who put him in chains, and kept him in prison for thirteen months. The Roman divinity most closely resembling the Greek Ares, and identified with him, was called Mars, Mamers, and Marspiter or Father Mars. The earliest Italian tribes, who were mostly engaged in the pursuit of husbandry, regarded this deity more especially as the god of spring, who vanquished the powers of winter, and encouraged the peaceful arts of agriculture. But with the Romans, who were an essentially warlike nation, Mars gradually loses his peaceful character, and, as god of war, attains, after Jupiter, the highest position among the Olympic gods. The Romans looked upon him as their special protector, and declared him to have been the father of Romulus and Remus, the founders of their city. But although he was especially worshipped in Rome as god of war, he still continued to preside over agriculture, and was also the protecting deity who watched over the welfare of the state. As the god who strode with warlike step to the battlefield, he was called Gradivus (from gradus, a step), it being popularly believed by the Romans that he himself marched before them to battle, and acted as their invisible protector. As the presiding deity over agriculture, he was styled Sylvanus, whilst in his character as guardian of the state, he bore the name of Quirinus. The priests of Mars were twelve in number, and were called Salii, or the dancers, from the fact that sacred dances, in full armour, formed an important item in their peculiar ceremonial. This religious order, the members of which were always chosen from the noblest families in Rome, was first instituted by Numa Pompilius, who intrusted to their special charge the Anciliæ, or sacred shields. It is said that one morning, when Numa was imploring the protection of Jupiter for the newly-founded city of Rome, the god of heaven, as though in answer to his prayer, sent down an oblong brazen shield, and, as it fell at the feet of the king, a voice was heard announcing that on its preservation depended the future safety and prosperity of Rome. In order, therefore, to lessen the chances of this sacred treasure being abstracted, Numa caused eleven more to be made exactly like it, which were then given into the care of the Salii. The assistance and protection of the god of war was always solemnly invoked before the departure of a Roman army for the field of battle, and any reverses of fortune were invariably ascribed to his anger, which was accordingly propitiated by means of extraordinary sin-offerings and prayers. In Rome a field, called the Campus Martius, was dedicated to Mars. It was a large, open space, in which armies were collected and reviewed, general assemblies of the people held, and the young nobility trained to martial exercises. The most celebrated and magnificent of the numerous temples built by the Romans in honour of this deity was the one erected by Augustus in the Forum, to commemorate the overthrow of the murderers of Cæsar. Of all existing statues of Mars the most renowned is that in the Villa Ludovisi at Rome, in which he is represented as a powerful, muscular man in the full vigour of youth. The attitude is that of thoughtful repose, but the short, curly hair, dilated nostrils, and strongly marked features leave no doubt as to the force and turbulence of his character. At his feet, the sculptor has placed the little god of love, who looks up all undaunted at the mighty war-god, as though mischievously conscious that this unusually quiet mood is attributable to his influence. Religious festivals in honour of Mars were generally held in the month of March; but he had also a festival on the Ides of October, when chariot-races took place, after which, the right-hand horse of the team which had drawn the victorious chariot, was sacrificed to him. In ancient times, human sacrifices, more especially prisoners of war, were offered to him; but, at a later period, this cruel practice was discontinued. The attributes of this divinity are the helmet, shield, and spear. The animals consecrated to him were the wolf, horse, vulture, and woodpecker. Intimately associated with Mars in his character as god of war, was a goddess called BELLONA, who was evidently the female divinity of battle with one or other of the primitive nations of Italy (most probably the Sabines), and is usually seen accompanying Mars, whose war-chariot she guides. Bellona appears on the battle-field, inspired with mad rage, cruelty, and the love of extermination. She is in full armour, her hair is dishevelled, and she bears a scourge in one hand, and a lance in the other. A temple was erected to her on the Campus Martius. Before the entrance to this edifice stood a pillar, over which a spear was thrown when war was publicly declared. Photo credit: Marie-Lan Nguyen / Wikimedia Commons.